The price of the large yellow diamond alternately shrank and spiked by about a million dollars as it moved across the globe. 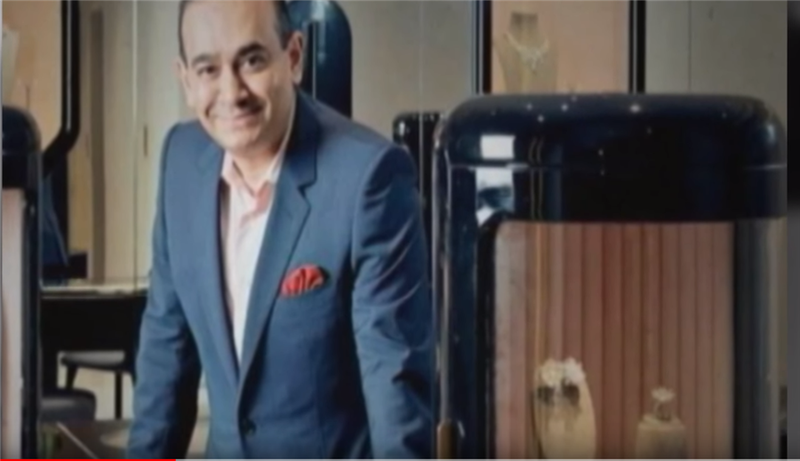 The three-carat gem was shipped at least four times between shadowy companies allegedly controlled by Indian billionaire Nirav Modi over about five weeks in 2011, according to a report by a U.S. bankruptcy examiner. The practice of round-tripping–trading a good repeatedly to give the appearance of distinct transactions–was central to the largest bank fraud in Indian history and ensuing criminal charges against celebrity jeweler Modi, according to the report filed Aug. 25. 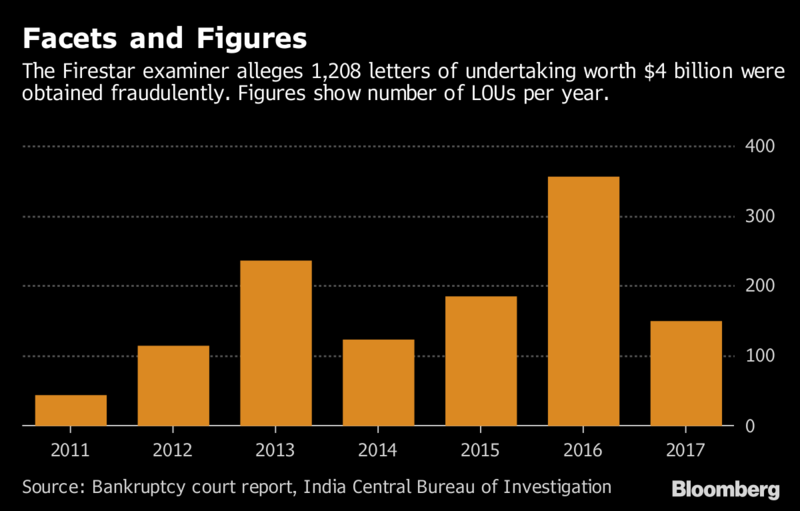 The rapid-fire sales were described as part of a plan in which Modi and associates fraudulently borrowed approximately $4 billion over a period of years by manufacturing sham transactions purportedly to ‘import’ diamonds and other gems into India using a web of more than 20 secretly controlled shell entities,” wrote John J. Carney, the examiner in the bankruptcy case of three U.S. jewelry companies indirectly owned by Modi. The firms sought protection from creditors in February in New York as the celebrity jeweler’s empire unraveled. Authorities brought criminal charges against him and alleged accomplices, and Modi became an international fugitive. He’s denied doing anything wrong. The “fancy vivid yellow orange cushion cut” diamond was first sold by Firestar Diamond Inc., a U.S. company indirectly owned by Modi, and shipped to Fancy Creations Company Ltd., a foreign shell company in Hong Kong also allegedly controlled by Modi, in August 2011, the report says. The price was almost $1.1 million. The colorful stone was then shipped out two weeks later by Solar Export, a partnership formed by the Nirav Modi family trust, back to Firestar Diamond in the U.S., for closer to what it was really worth: $183,000, the examiner wrote. Less than a week later, Firestar, which has offices on Fifth Avenue in New York City, shipped the diamond back to Fancy Creations in Hong Kong, this time for $1.16 million, the report asserts. And two weeks after that, A. Jaffe, the New York City-based diamond company owned by Modi, sold the diamond to World Diamond Distribution, which the report describes as a Modi shell company in the United Arab Emirates, this time for more than $1.2 million. The practice of round-tripping, which ultimately totaled $213.8 million between 2011 and 2017, the alleged duration of the fraud, generated shipping invoices that were given to the Indian state-owned Punjab National Bank to obtain short-term loans using letters of undertaking, according to Carney. The proceeds were then used to fund Modi’s lifestyle and business entities as well as using the funds from new loans to repay the old ones as they came due, the report states, citing a real-estate trust controlled by Modi that paid $25 million in cash for a luxury apartment in the Ritz Carlton on Central Park South in 2017. Some of the shipments were so large and high-priced “that the packing slips alone should have raised suspicion,” wrote Carney, a former investigator and prosecutor for the U.S. Securities and Exchange Commission and the Department of Justice. Carney was appointed in April to investigate links between the Modi-owned U.S. companies and other Modi-controlled entities. In a break with industry practices, the Modi-owned U.S. companies exported diamonds via FedEx instead of with a bonded courier — including a 17-carat stone sold for $1.7 million and sent from New York City to Hong Kong — even though FedEx insures packages only up to $150,000, the report states. “There is no legitimate business reason to ship diamonds worth millions of dollars without obtaining appropriate insurance,” Carney wrote, citing a gem expert retained by the bankruptcy trustee. The report found “substantial evidence” to back up Indian criminal and civil authorities who say Modi’s U.S. companies and senior officials were involved in transactions related to alleged bank fraud and money laundering. Modi, 47, comes from a family of specialist gem cutters, and he has draped his jewels on Hollywood and Bollywood stars, including Kate Winslet, Naomi Watts and Priyanka Chopra. He bought A. Jaffe, an iconic engagement ring company founded in Manhattan in 1892, to add to his collection of brands in 2007 and opened eponymous boutiques in New York City, Macau, Singapore, Beijing and London. Now, he is reportedly in the U.K. and the Indian government has asked authorities there for his extradition. The charges against Modi have sent shockwaves through Indian banking and politics as well as the international jewelry industry. The alleged crime undermined the prime minister’s anti-graft image and Punjab National Bank posted India’s biggest-ever quarterly bank loss this year after it took a $2 billion hit. The U.S. examiner’s report “strengthens PNB’s position as a victim of a complex, multi-year fraud,” and the lender is expected to argue for a share of the sale proceeds once Firestar’s assets are sold and secured creditors are satisfied, said Seth R. Freeman, San Francisco-based senior managing director at financial services advisory firm GlassRatner. A representative for Macy’s, which had previously bought jewelry from Firestar Diamond Inc., said in an email Monday, “We canceled all purchase activity with the company as soon as we became aware of the situation earlier this year.” Costco Wholesale Corp. and Zale Corp. declined to comment and J.C. Penney’s didn’t answer a message. Other Modi associates were involved, according to Carney’s report, including Mihir Bhansali, chief executive at two of the Modi-owned U.S. companies. Bhansali went to the office of Firestar Diamond in Dubai shortly after those companies filed for bankruptcy in February, according to an account given by the general manager of the Dubai office to Indian authorities and described in Carney’s report. Speaking before employees in Dubai, Bhansali folded his hands and bowed, then asked them not to return to India or mention his name to any government authorities, according to the report. Bhansali then took hundreds of thousands of dollars in cash and 50 kilograms of gold and left town, the report asserts. Bhansali’s lawyer, Thomas McCormack, declined to comment, but said in a letter to the examiner that his client denied any wrongdoing.